The police were hunting a 22-year-old Moroccan man, Younes Abouyaaqoub, suspected of driving the van used in Barcelona. They warn he could be at large outside Spain. 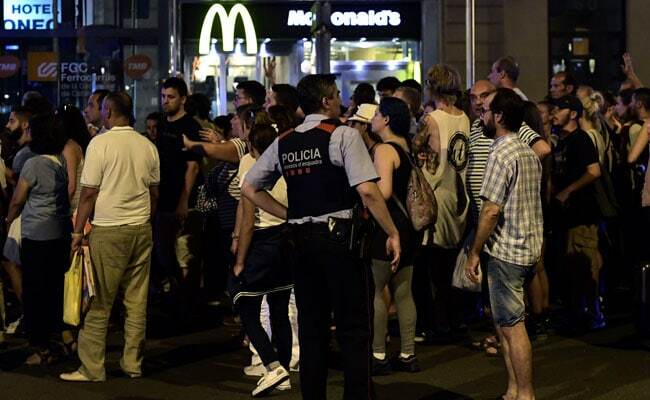 The ISIS claimed responsibility for the attacks, believed to be its first in Spain. Barcelona: Spanish authorities hoped Monday to identify all 14 victims of the deadly attacks in Catalonia and the members of the terror cell behind it, as a manhunt deepened for one suspect still at large. With the 12-person cell dismantled, police were hunting a 22-year-old Moroccan man, Younes Abouyaaqoub, suspected of driving the van used in Barcelona. They warn he could be at large outside Spain. Investigators believe the terror cell comprised at least 12 men, some of them teenagers. An imam, Abdelbaki Es Satty, 40, is among the suspects, believed to have radicalised youths in Ripoll, a small town at the foot of the Pyrenees, where several suspects -- including Abouyaaqoub -- grew up or lived. Spanish media said the imam had spent time in prison. El Pais and El Mundo said he had met prisoners linked to the Al-Qaeda-inspired bombing of Madrid trains that killed 191 people in March 2004, the worst terror attack in Europe. The imam has been missing since Tuesday. On Saturday, police raided his apartment. They have raised the possibility that he died in an explosion Wednesday evening at a house believed to be the suspects' bomb-making factory, where police uncovered a cache of 120 gas canisters. The suspects accidentally caused an explosion at the house on the eve of Thursday's attack in Barcelona -- an error that likely forced them to modify their plans. In the evening, local football heroes FC Barcelona staged a minute's silence at the 99,000-capacity Camp Nou stadium for their first game of the league season, against Seville-based Real Betis. Barcelona stars including five-time World Player of the Year Lionel Messi wore shirts with "Barcelona" replacing individual names on the back, while their opponents donned shirts with the message "Real Betis with Barcelona". In Paris, a mass in Notre-Dame Cathedral was attended by the city's mayor, Anne Hidalgo and France's minister of European affairs, Nathalie Loiseau.